Khaki Depot offers the products in three basic sizes, medium, large and extra large. 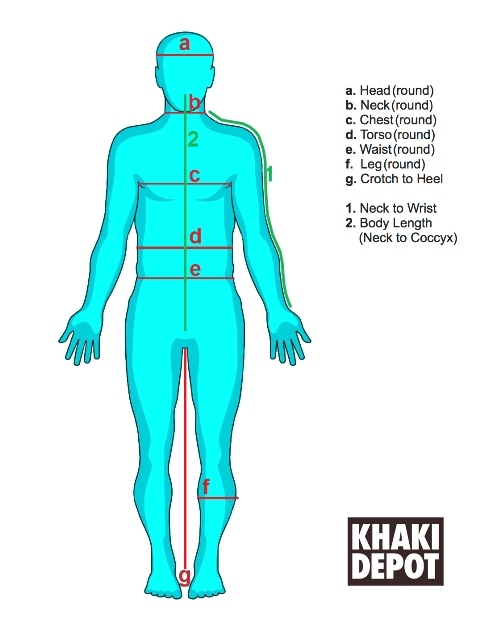 In case you need to make a special request please contact us at info@khakidepot.com after consultιng the size chart. Measure from the top of the head to the floor. Hold the end of the tape measure in the middle of the forehead (above the ears) and around the head (or wherever you would like to position the cap/hat). Place the tape measure around the neck at the level at which the shirt collar would be buttoned. Put 2 fingers between the tape and your neck and allow a snug but comfortable movement. When measuring for the sleeve length, put the tape measure below the neck, centered with the spine. Let the tape go down the shoulder, down the elbow and end the measurement 1.5 inches past the wrist bone. Put the measuring tape around the broadest part of the chest, making a complete circle around the chest. Measure around the top of the hip bone, slightly above the belly button and leave some room for a comfortable fit and for sitting down. If you have large hips add additional room. If you need to find your waist line - stand with your feet slightly apart and bend to the side. Where your waist creases is the natural waist line to measure around. Put the tape measure around the largest part of the hips (normally around the buttocks). The tape measure should be snug but not to tight to allow movement. Measure the right foot from the bottom of the crotch to the ankle. While standing straight measure from the top of the hip bone all the way to the floor and subtract half of a an inch.